Hannah Emmert and Tom Vander Well in Union Street Players production of "Annie"
I’ve written before about the very real phenomenon called an “actor’s nightmare.” It’s when you dream that someone grabs you in a panic and reminds you that you’re on. Suddenly you remember that you were cast in a play but you can’t remember what the play was, what role you’re playing, nor can you remember studying any of your lines. You are then thrust onto the stage as everyone looks at you waiting for you to deliver your line. If it’s a true actor’s nightmare you’ll realize at this point that you’re standing in your underwear. 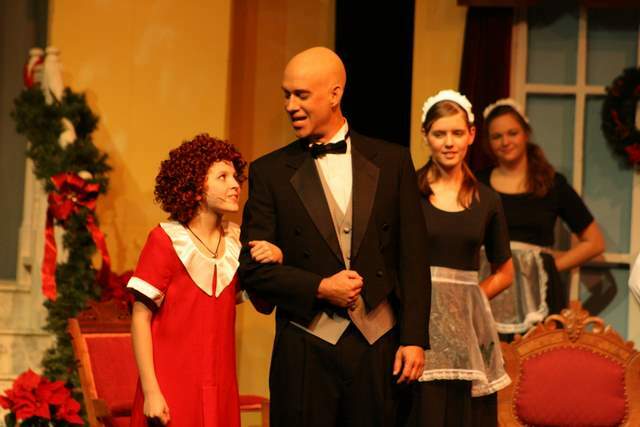 During last night’s performance of Annie, I came close to experiencing a variation on an actor’s nightmare. In the second act, just before the grand finale, I run off stage for a costume change. I have to get out of my suit and into my tuxedo in 90 seconds. My wife Wendy is there waiting to help and we have the whole process down to a well rehearsed quick change. Last night I made my sprint off stage and down the steps to the clothes racks in the back hallway. It was then that the actor’s nightmare set in. There was no tuxedo. There was no Wendy. In that moment, I realized I’d forgotten to set my tux backstage before the show. There are no adequate words to describe the sheer panic that sets in this moment of time, though “terror” comes close (after a Warbucks-esque expletive). Where’s Wendy? Did she forget, too? Is she getting my tux? In that moment, a dark, frizzy-haired figure came sprinting around the corner with a bulky bundle in hand. For you movie buffs, Joan Cusack‘s frantic run in the film Broadcast News flitted through my brain at that moment. Wendy dumped my tux on the floor and we began throwing on the pieces. My ears were perked to the song on stage. We were running out of time. Vest on. Button. Button. Button. Hurry Coat on. “THERE’S NO BOW TIE!” she repeated. “Are you off stage again?” she asked. “I’ll get it!” Wendy exclaimed in a whisper. I resigned myself. For now, I’ll have to go on stage in a tux without a bow tie. 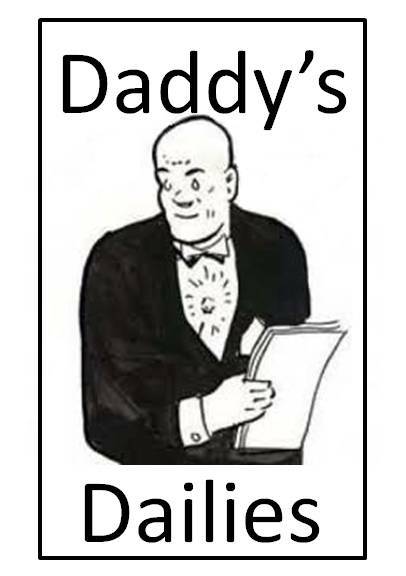 Warbucks will be a casual kind of formal tonight. We have no choice. Wendy sprinted off as I marched up the steps to the back stage door and remembered to tie my shoes. I don’t know how she did it, but Wendy made a sprint worthy of Usain Bolt back to the dressing room. Just as the moment for my entrance arrived, she ran through the back stage entrance with my bow tie in hand. Fortunately, it was the kind that clips on. I was fully aware that everyone on stage was wondering where in the world I was as Wendy anxiously tried to get the tie hooked. I sprinted on stage before Wendy had a chance to straighten it. It was about four inches left of center. Think. How am I going to fix it? Fortunately, my first line is to direct everyone’s attention to the staircase where Annie emerges in her iconic red dress and curly hair. I simply turned my back to the audience raised my hand to the grand staircase and delivered my line. Knowing that everyone was looking for Annie, I reached up and yanked my tie in place. Whew. Major crisis averted. Focus now. I owe Wendy big-tim (and she knows it). Besides that little potential tragedy, last night’s performance went really well. The crowd seemed livelier than Friday night’s audience. Hannah Emmert did a masterful job in her first performance as Annie. Today’s matinee at 2:00 p.m. is nearly sold out. There are a few tickets left in the balcony. Get to the community center early (I’d suggest 1:20) if you want to get one of the remaining seats. As for next weekends performances, the floor seats are nearly gone. Thursday remains your best hope for a seat on the main floor. Balcony seats are still available. Don’t worry. You won’t be disappointed with a balcony seat. The view is great and the younger key cast members are mic’d so you can hear all the lines.